The luffa is an annual climbing plant from the cucumber family. 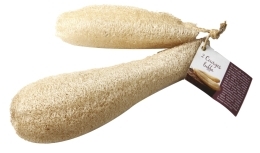 The fully developed fruit of this plant is the source of the loofah sponge that can be used in the bath. The sizes and shape may be slightly different. Biodegradable. Can be used in the bath. The loofah needs to be soaked well in water, before its use and it then become soft and gentle on your skin. Caring for your loofah: rinse it after each use, hang it to dry by placing outside of contact with water (it is important that you dry the loofah completely between uses); run it through a hot wash cycle occasionally; replace it when it starts to fall apart or as it shows loss of texture.